This podcast series will share how creative ideas have made the Tallahassee community more successful and the catalysts behind them. It will also highlight how quality of life and innovation serve as key drivers in retaining talent. Created by Knight Creative Communities Institute Tallahassee (KCCI) is responsible for transformative projects all over Tallahassee like Gaines Street, Cascades Park, Midtown, the new TLH urban park and the #iHeartTally campaign. Find out more at www.kccitallahassee.com. Happy Thanksgiving! This week we have a special, shorter episode featuring former and future podcast guests sharing why they are thankful and grateful for the Tallahassee community and what they have and have built here. 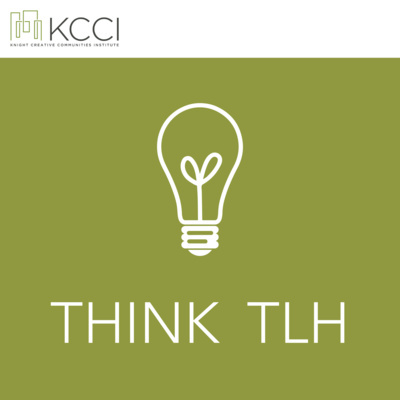 We are so thankful for all of the Think TLH podcast listeners and guests and the support from the community. Enjoy! Hurricane Michael devastated the panhandle coast before hitting Tallahassee, Florida. Alex and Chelsea Workman and Jesse Taylor collaborated for the first time on a creative project that is benefiting those affected by the storm. Listen in to find out how this idea sparked in the Hurricane aftermath. 100% of the proceeds from the Never Forgotten Coast campaign sales will go to LOCAL Mexico Beach/Port St. Joe based non-profits, directed specifically to their Hurricane Michael relief funds. Learn more: http://bit.ly/FLForeverShirt More ways to help: https://bit.ly/2qhulO8 Thank you to all of the first responders, linemen, police, firefighters and others who have helped the community recover.